Easily integrate Turnitin and other LTIs. In the LTI Credentials section, click Add. 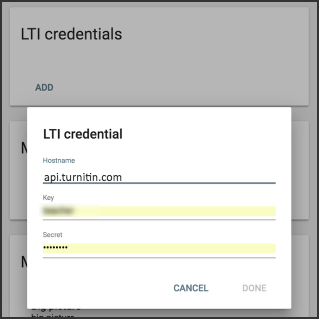 The account Secret (configured by your Turnitin administrator in the Turnitin LTI integration setup). To integrate other LTIs, follow these same steps using the proper information. Consumer Keys and Shared Secrets are generated for individual institutions. Your institution should have the necessary information. Is there a way to add LTI integrations to all Buzz domains at once, or do you need to add them one domain at a time? 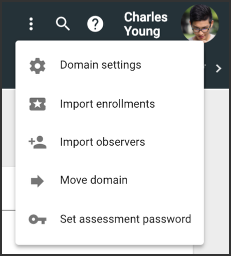 This has to be done one at a time through the UI, or can be updated across multiple domains using the API. Is there way to add LTI integration to activity with with some HOSTNAME and different KEY/SECRET if we have global LTI integration for DOMAIN ? The following article should address adding an LTI integration to items if there is a domain integration in place: How do I create activities with Learning Tools Interoperability (LTI)?